Guitar Practice: No Pain No Gain? In this excerpt from SFS Pentatonics 2 - Navigating Chord Changes we deal with a subject that troubles a number of players. 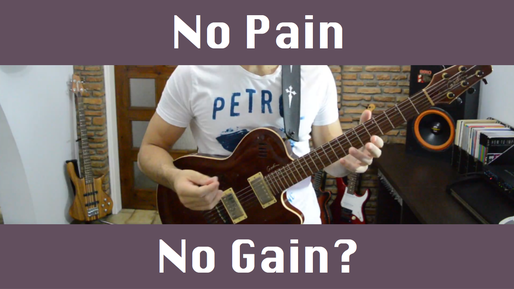 I decided to post this on the EMP Blog, so that even if you are not into navigating chord changes right now, you can still share your thoughts on using the “No Pain No Gain” approach when practicing. "This is one of those lessons that are kind of short, but require long practice. Here’s why. In my years of practicing and teaching guitar, I caught myself and my students many many times developing habits that need breaking. As guitar players, and especially as improvisers, we tend to subconsciously choose the path of least resistance and end up using just a small part of what we practiced because that’s the part that comes easy for us. This of course can be a good thing. It’s good to develop your strong points and let go of things that are just not you. This is what will eventually develop your musical personality and it’s also the only way to really enjoy your practice. So when something feels like it’s not working, and steals the joy and the love out of your playing, then by all means drop it. But sometimes we end up on the other extreme and allow ourselves to be limited in a little box because we are afraid of the discomfort of stepping out, when just a little bit of effort and consistency can make what seemed foreign, become easy. Many times we need to tough it out a little bit, in order to open up new possibilities in our playing. One of these habits that can be broken with a reasonable degree of effort, is the tendency to always begin our phrases in the same direction, usually ascending. If you recorded yourself improvising with last lesson’s assignment, most of you started on the root note and immediately took off in the ascending direction. You can still make your playing interesting this way, but if you add the descending direction in your phrase opening options you will immediately see your solos improve, and your improvisation language will become richer. So here is how to achieve this: Just repeat last lesson’s assignment, but in the descending direction. So for the scale exercise go down up and back to the root , and in your improvisation start the first phrase of each new chord change in the descending direction (but then of course continue freely any way you want). Of course that’s not possible when starting on the 6th string for minor so you can skip that. Here is an example with minor pentatonics and blues scales, using the 4th string for root note location. You should do this on all strings, and when you’re ready I’ll see you in lesson 9."